November 16, 2015 Guy Selga Jr. Season of the Force has started at Disneyland which means Tomorrowland is bursting at the seams with all that thick gooey Star Wars goodness that we all crave so badly. This celebration is half promotional extravaganza for the upcoming film, and half something to hold us over until Star Wars land opens in a few years. As you enter Tomorrowland you’ll see signs and banners everywhere, with the Season of the Force logo. Also, the background music in the entire land has been replaced with a medley of Star Wars tunes. The biggest addition to Tomorrowland brought on by Season of the Force is Star Wars Launch Bay, located in the former Innoventions building. The building no longer rotates and has had its gadgets and technology exhibits removed. 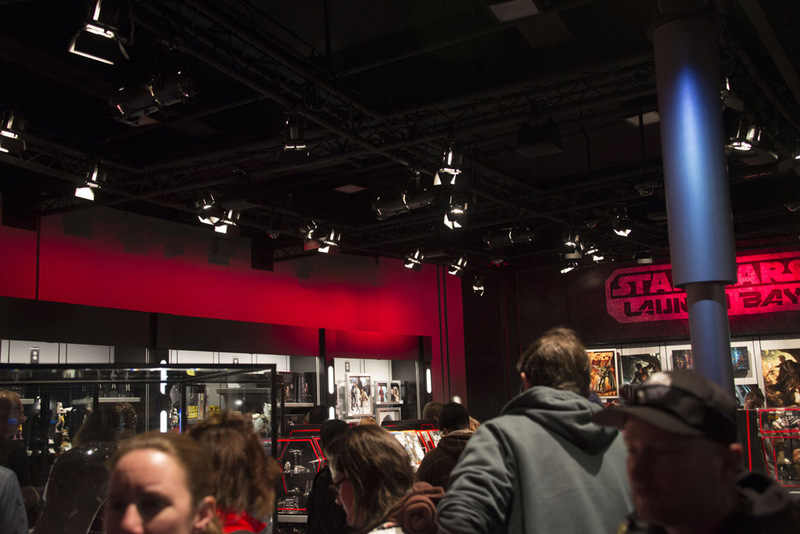 Instead you’ll find meet and greets, models from the 7 Star Wars films, and a gift shop. 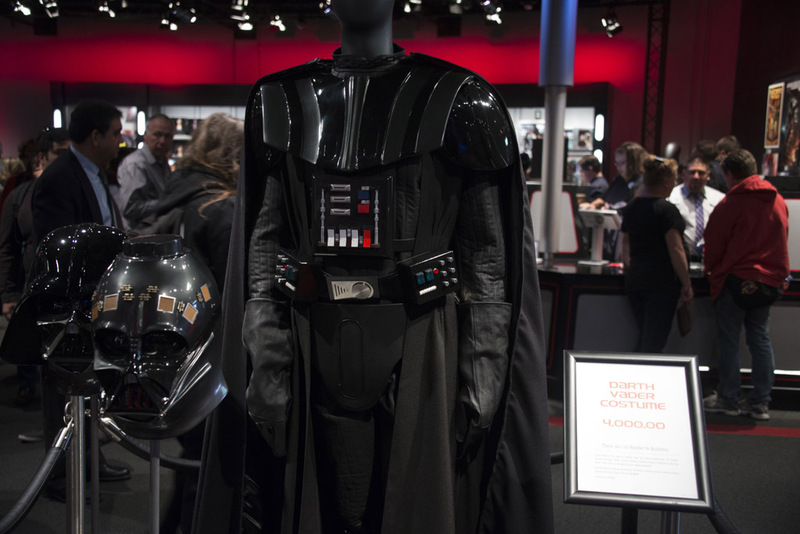 Seen above is the Chewbacca, but there’s also a Darth Vader meet and greet. Both characters will “talk” and interact with guests during the encounters. The lines for these characters are quite long, reaching as high as 75 minutes, but on the plus side you are given plenty of one-on-one time which can cause some fun interactions. 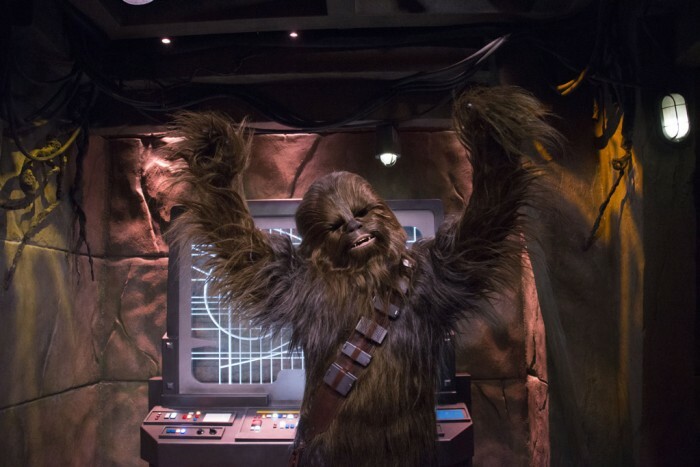 When entering the Launch Bay you’ll see three separate lines, one for Chewie, one for Darth Vader, and one to simply enter the Launch Bay. The line to enter the Launch Bay will always be the shortest as several hundred people at a time can fit inside. Much more about Star Wars Launch Bay and Season of the Force after the jump. 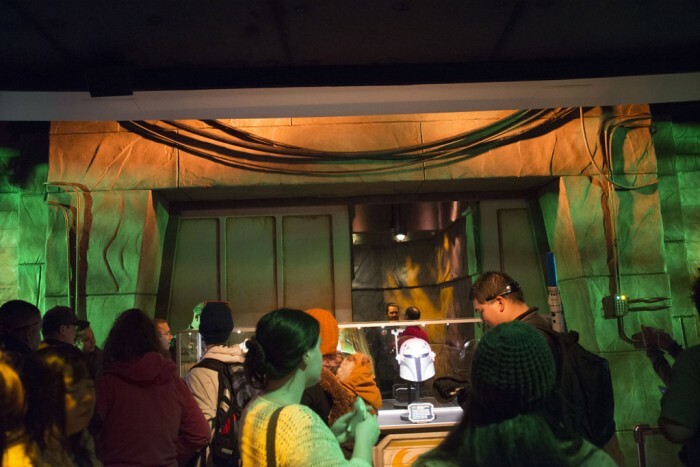 The queue for each meet and greet is themed after each characters alliance. While waiting for Chewbacca it looks like you’re standing in front of a rebel base. 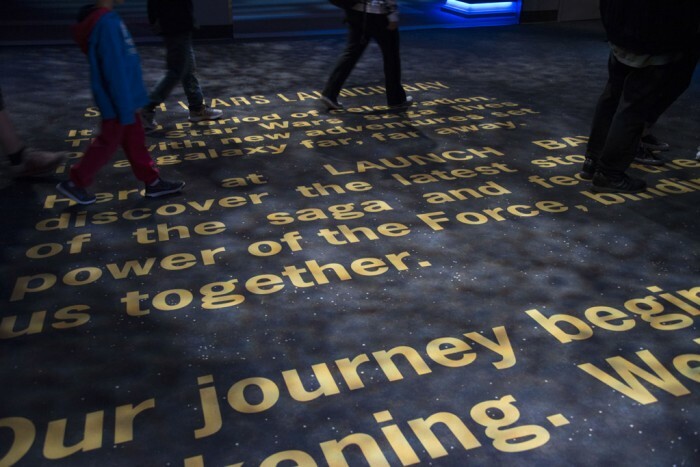 After entering Star Wars Launch Bay you’ll see the floor has its own version of the iconic Star Wars opening text crawl. 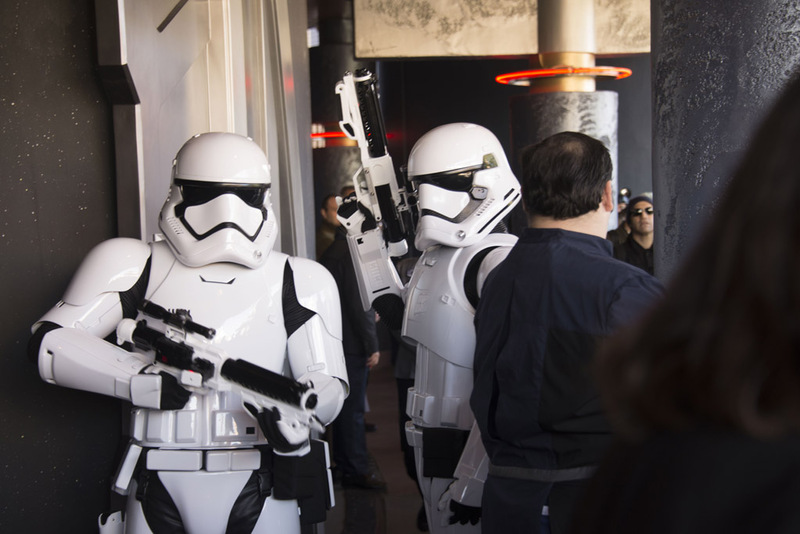 Rebel helmets and and Jedi props seen in the Chewbacca meet and greet queue. 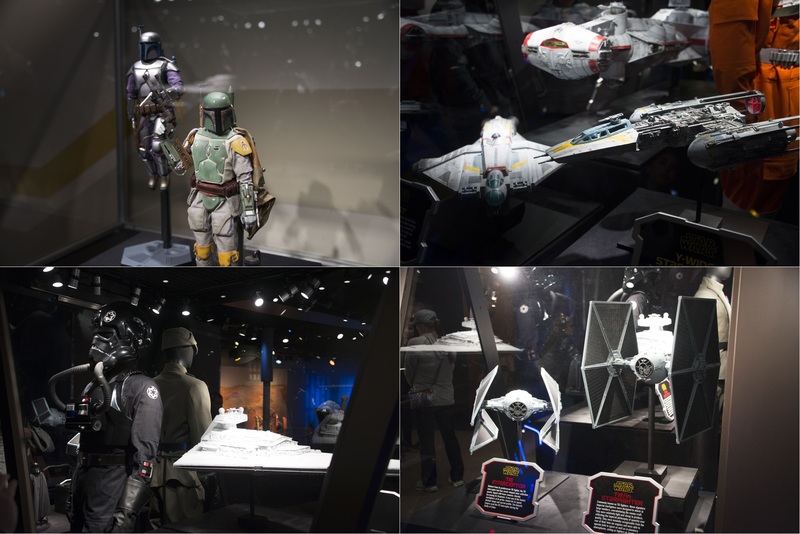 One of the highlights of Launch Bay is the props, costumes and models from the seven Star Wars films, including some from Force Awakens. Props are separated in to four different galleries, including Light Side Gallery, Dark Side Gallery, Preview Gallery and Starship Gallery. 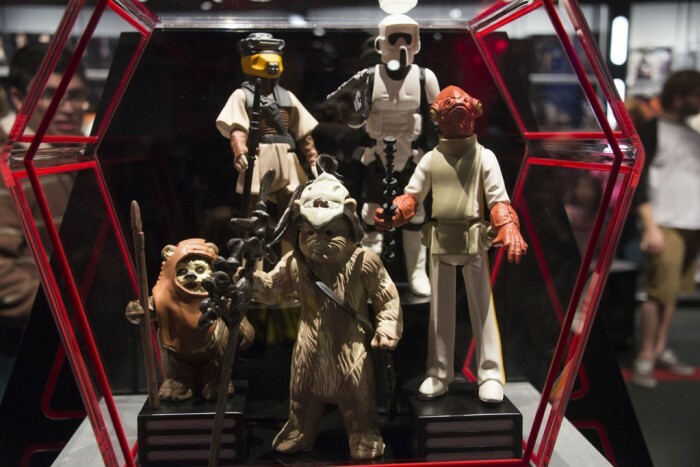 Giant-sized versions of classic Kenner Star Wars action figures. Or how about a replica Darth Vader costume for only $4000? Impress your friends with your very own Yoda statue. 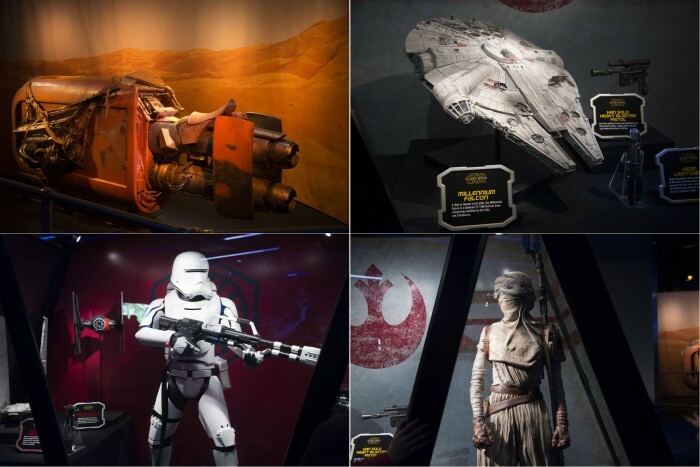 In the Preview Gallery you’ll find a screen showing behind the scenes footage and interviews of Star Wars: The Force Awakens. 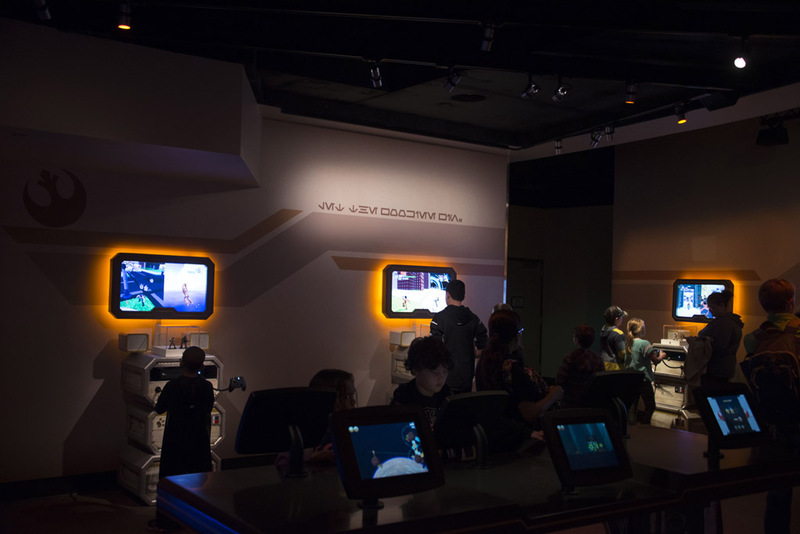 You can also test out the latest Star Wars video games on several demo kiosks. 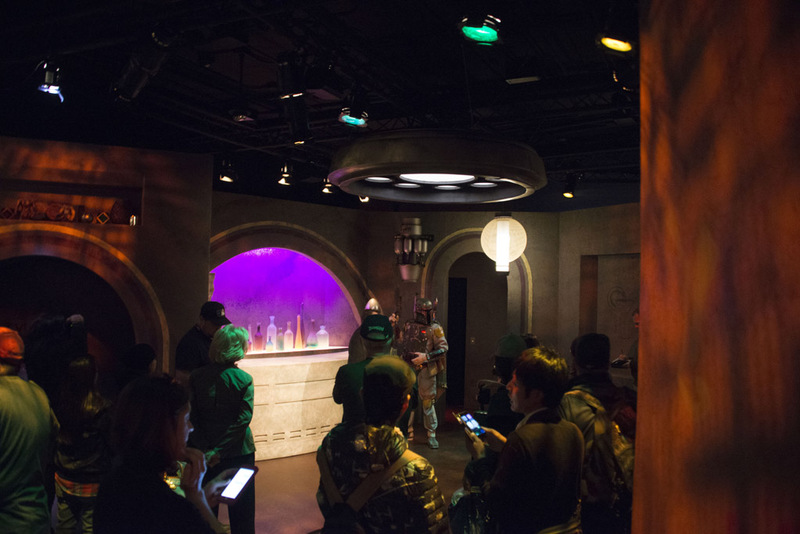 There’s also an area themed after the Cantina from A New Hope. It’s worth noting that no food or beverages are sold here, but characters like Boba Fett will occasionally appear for a meet and greet. Moving on from Star Wars Launch Bay, Space Mountain has been transformed in to Hyperspace Mountain. 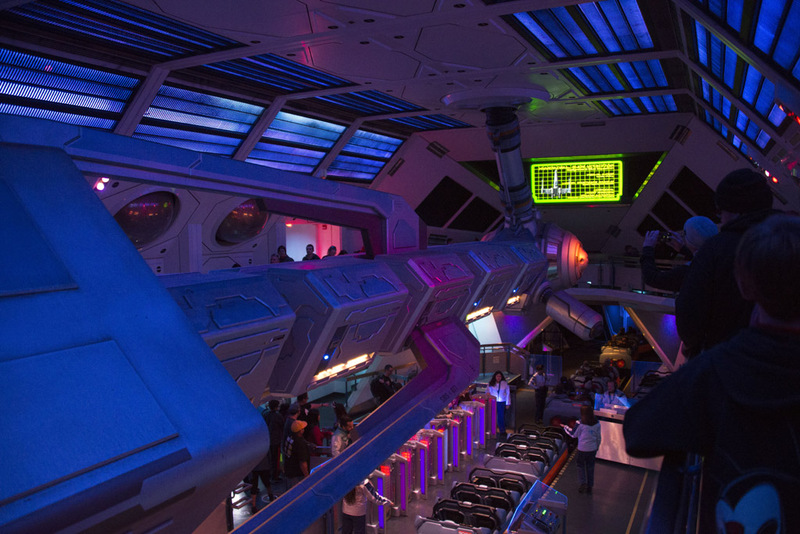 If you’ve ever ridden the Halloween version, Space Mountain: Ghost Galaxy, then you know what to expect here. The spooky ghosts have been swapped out for Tie Fighters and X-Wings. 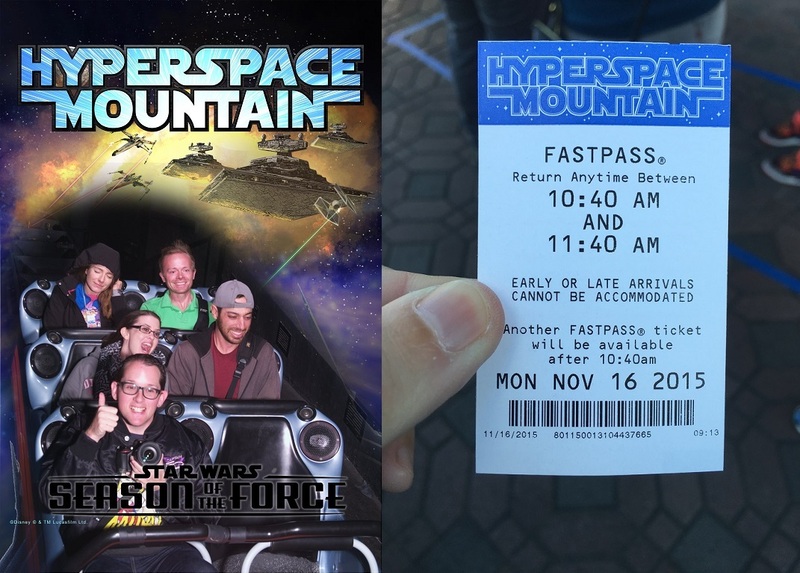 It’s a definite must see and we recommend obtaining Fastpasses for it as soon as you enter the park each morning. The attraction is expected to draw larger-than-usual crowds for the next few months. Hyperspace Mountain even got its own on-ride photo and Fastpass designs. It wouldn’t be a special Disney event without the food. Tomorrowland Terrace has been renamed to Galactic Grill and has received a new menu of Star Wars-themed food. Here you can see a couple of the… uh… highlights? The First Order Specialty Burger’s gimmick is that the bun is black. While this may repulse some people I found it to taste almost exactly like any other Disney hamburger I’ve ever eaten. On the right is “The Pastry Menace” which is an eclair filled with Spicy Milk Chocolate. It was tasty but I tasted zero spice in the filling. Also the little spikes sticking out of it looked like old toenail clippings to me, but they’re actually peanuts. Thank the Maker, you can also get Star Wars food for breakfast. Here’s the Bantha Blue Milk Bread, which is simply French toast, but blue. If you’ve ever had Disney quick service French toast before then you know exactly how this tastes. If you don’t mind spending $7 on a non-alcoholic drink then you can treat yourself to the Light or Dark Side Specialty Drink. 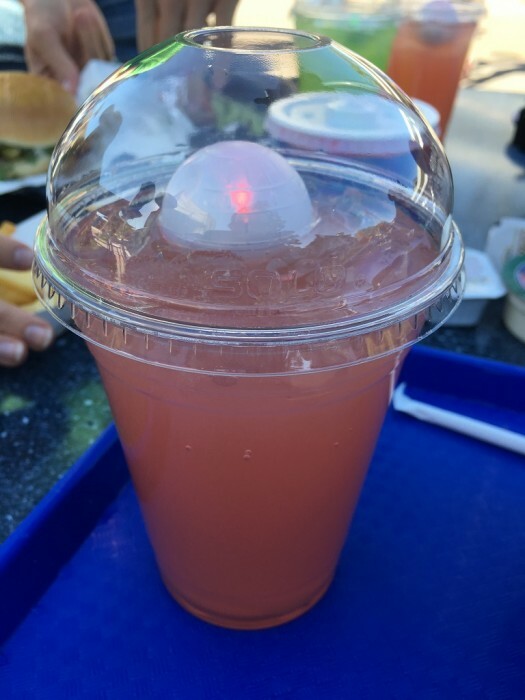 The Dark Side drink seen here contains All-Natural Odwalla Lemonade and Strawberry and includes a souvenir light-up Death Star glow cube. Stormtroopers roam the land during Season of the Force. They also did this before Season of the Force but now they are the new-style troopers from Star Wars: The Force Awakens. Also new is that they can talk and interact with guests. 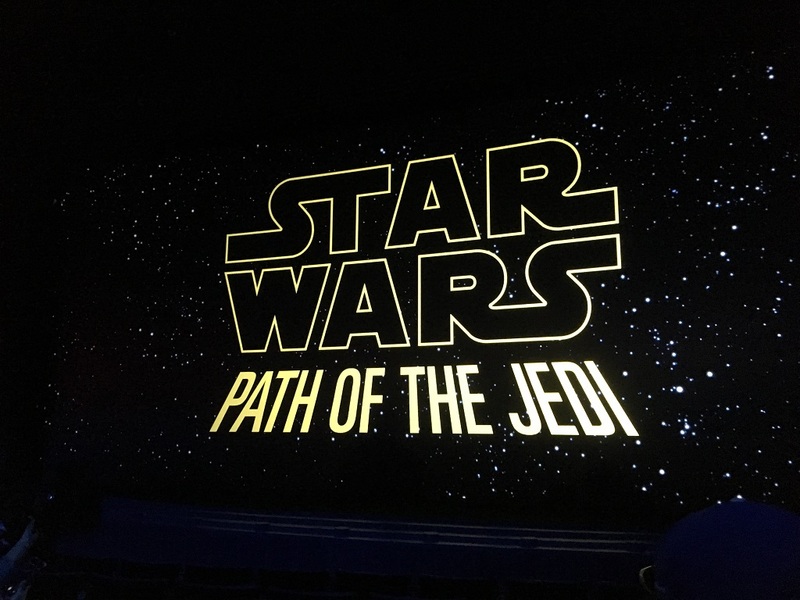 The Tomorrowland Theater is home to Star Wars Path of the Jedi, which is a quick recap of the six Star Wars movies, as well as the latest trailer for The Force Awakens. There’s nothing new to see here but it is fun to see clips from the films up on a big screen again. 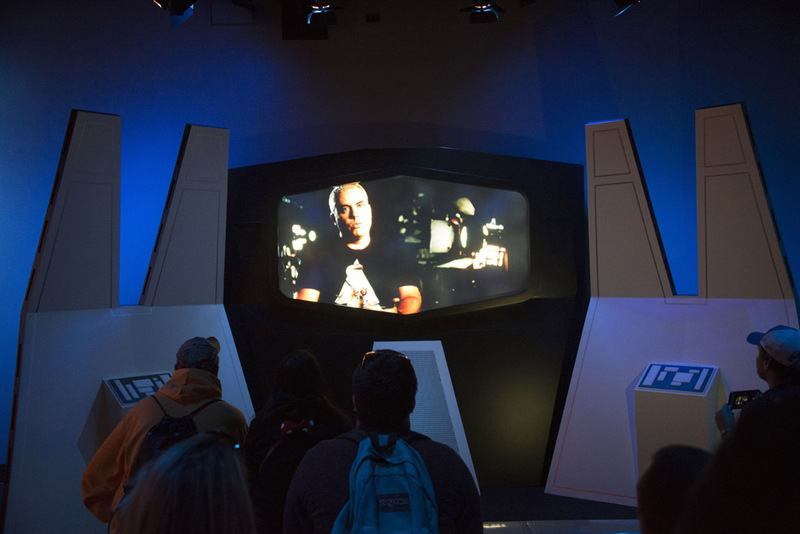 Before I wrap this up I should mention that Star Tours has received a new scene based on The Force Awakens. I won’t spoil anything here but I will say that the new scene is a lot of fun. Disney has said that you are guaranteed to see the new scene for the next couple of months, so don’t worry about missing out on it when you ride. 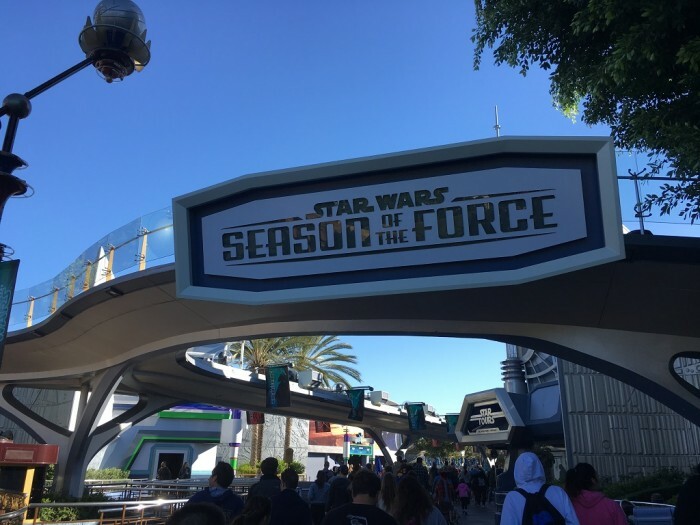 What do you think of Season of the Force? 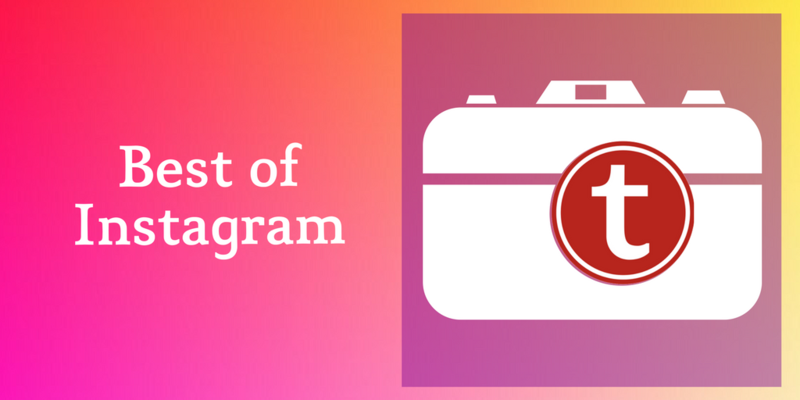 Are you excited to experience everything it has to offer? Are you losing sleep at night because of how excited the thought of eating blue French toast makes you? Let us know in the comments below. This is happening right now at Disneyland? And will still be happening in January? 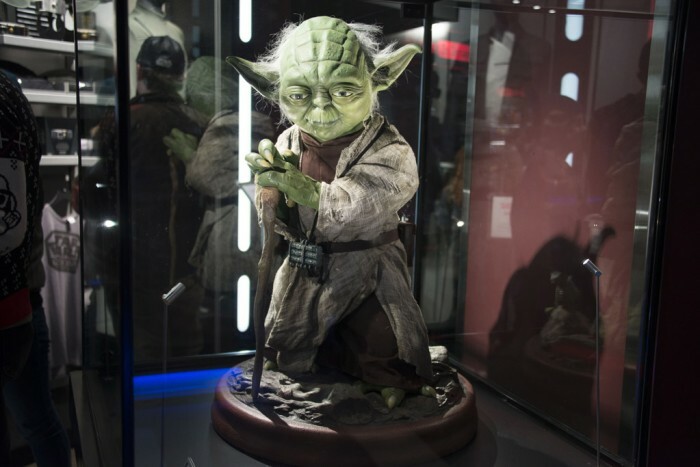 Don’t want to wait for Star Wars Land to open? Yes it is open now. Rumor is that it will be around until at least may.